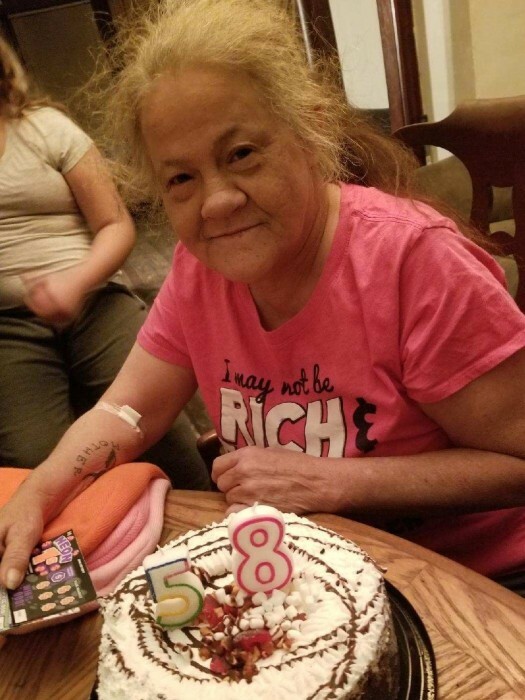 Julie Lynn Torres passed away Tuesday October 9, 2018 in her home surrounded by her family at the age of 58. She was born in Toledo November 8, 1959 to Robert & Janice (Butler) Cousino and attended Start High School Class of 1977. Julie worked for various different cleaning services all while being a homemaker to her family. On June 4, 1994, she married her lifelong friend and companion Oscar Torres. Julie enjoyed playing with her dog “King” and Candy Crush. Her greatest love was spending time with her family particularly her grandkids. She will be deeply missed by all who knew her from her family to her extended kids and grandkids. Julie is preceded in death by her parents and brother Donald Cousino; she is survived by her hubby Oscar “YOKA”; children Crystal Evans, Donald Browder and Beth (Charles) Torres; grandchildren Aaliyah, Lazaro, Izayah, William, Natasha, Izabella, Charles Jr. and Aubrianna; and brothers James (Eva) and William Cousino. Family will receive friends at the Castillo Funeral Home 1757 Tremainsville Rd. Wednesday Oct. 17 after 4 PM followed by a Celebration of Life Ceremony at 7 PM. Memorial tributes may be made to the family to offset expenses.